'DVD Identifier' retrieves and interprets the pre-recorded information that is present on all DVD+R/+RW and DVD-R/-RW Media and now also Blu-ray media (BD-R and BD-RE). 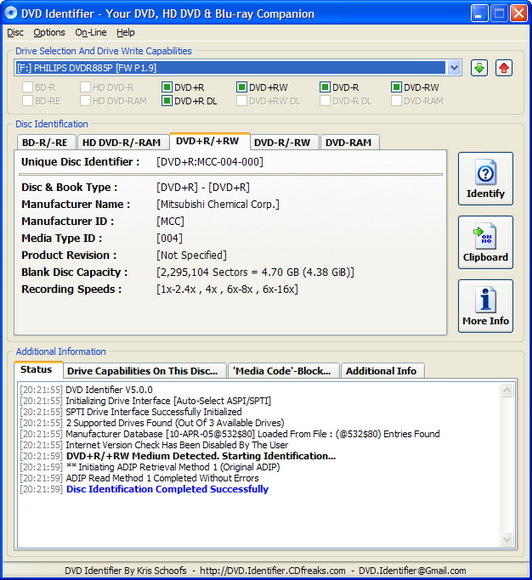 This information contains a variety of parameters such as disc manufacturing information and supported write speeds. All this information is especially useful for uniquely identifying discs when comparing the quality of different discs. Since the packaging of a disc is not a reliable way of identifying it (e.g. different brands can still have the same manufacturer and some discs don't even have any labeling whatsoever) "DVD Identifier" now offers a 100% reliable method to distinguish between discs. Simply put, 'DVD Identifier' allows you to find out who really made the media you are using. Added detection of 6x bd-r discs (blu-ray). Updated manufacturer database, now containing over 900 discs from nearly 100 different manufacturers. Several other small changes and improvements.